Think of Disney and your mind jumps to Mickey and Minnie, Donald Duck and innumerable princesses. That is, if you're not a member of the Cars generation. Animated flicks, theme parks and merchandise will forever be a part of Disney's multi-billion dollar empire, but the entertainment powerhouse is also looking to seed itself in more modern forms of content delivery. "Mobile and tablets have always been a huge part of the strategy for Disney Infinity," John Vignocchi, executive producer at Disney Interactive Studios, said during a media briefing yesterday, referring to the company's ambitious gaming initiative (more on that later). To move that mobile-focus forward, Disney announced two apps: Disney Infinity: Action! for iOS, Windows Phone and Android, and Disney Infinity: Toy Box for the iPad. The latter is of particular note because it will join the first-ever offering that allows user-generated content to be shared across multiple platforms, according to Disney. Disney Infinity, launching Aug. 18, is a video game platform that essentially involves placing real-world objects - character figurines, power discs and Play Set pieces - on a board called the Infinity Base. It's similar to Activision's Skylanders and even Rovio's plans for Angry Birds Star Wars II. Characters from both Disney and Pixar films can tool around in appropriate "Play Sets," or game worlds. 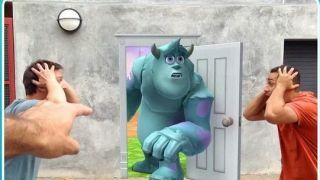 Jack Sparrow, for example, will swashbuckle through a pirate realm while Sulley will scare over at Monsters University, with neither compatible in the others' setting. Within each Play Set, players can collect characters, vehicles, upgrades and gadgets as they advance through levels. These are then stored in their virtual "Toy Box," which a player can access to create their own Disney adventures in an open world environment. The story possibilities, says Disney, are infinite. Cross-platform action comes into play as Toy Boxes are cloud stored with a Disney ID, which users can then tap into on a PS3, Xbox 360, Wii, Wii U or PC, switching to any platform to access saved data. A Toy Box world created on a PlayStation can be edited on an Xbox before more tweaks are made on a Wii U. With the introduction of the Toy Box app, mobile too joins the flow. "We want people to build wherever they are inspired," said a Disney Interactive producer about the iPad app's ability to let users play wherever and whenever. A demo showed how a Toy Boxer (as we've dubbed them) can utilize a tablet's multitouch capabilities to quickly craft a game world, then pick up an Xbox controller and continue right where they left off, with little lag in syncing. The app is free and comes with a complimentary character (Mr. Incredible) but in-app purchases are $.99 (about £.64, AU$1.09) after that. It will be available in most regions in the coming weeks, while a few countries will see the app in September. Though limited to the iPad to start, Vignocchi told us after the presentation that Interactive is exploring other mobile platforms. "We thought, 'Which device has a great interface that really uses the touch screen controls the best?'" he said of launching of Apple's slate. "We had evaluated other tablets and we're continuing to evaluate other devices, Android-based devices as well, and we're looking at what makes the most sense. Primarily we're focused on Apple and iPad but I think real soon you're going to see us venture into other platforms before the end of the year to bring the Toy Box experience there." He was less forthcoming with information on compatibility with unreleased consoles, meeting our query about whether the app will work when the PS4 and Xbox One launch with a "we're not talking about our next-gen plans." Vignocchi did share the "fun" of getting Microsoft, Sony and Nintendo to agree on cross-platform compatibility, however. "As far as we know, this is the first time this has ever been done," he said. "And so getting all the first parties together then telling them, 'You know, here's what our plan is,' and then getting everyone to agree was definitely a challenge. But given Disney's history with first party, they were willing to let us embark upon it and work with the others." Disney Infinity: Toy Box will be compatible with the iPad 2, iPad 3, iPad 4 and iPad mini. It is, to be sure, only part of a much larger mobile strategy for the House of Mouse. If you've ever played around with the Action Movie FX app, you have some idea of what Disney Infinity: Action! entails. There's no Michael Bay-esque explosions in this app, however, as users have the option of creating a movie featuring animations of Mr. Incredible, Sulley and Jack Sparrow and starring real-world characters (a.k.a. yourself, family and friends). The app has over 30 different animations and dozens of props, including some from films like Tron and Toy Story. After stitching together your flick using Movie Maker, wannabe Walt Disneys can upload their movies to Facebook, YouTube or share via email. Action! is free and will be available in iTunes and the Windows Store tomorrow, and it will land in the Play Store soon. Vignocchi said Action! and the Toy Box app are intended to grow over time, and are "our two footprints primarily in the mobile space." As for whether Disney has its sights on developing its own hardware, he wouldn't budge. "I can't comment on future technology plans, but it's a great question."